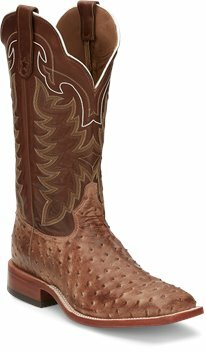 Walk with confidence in the Hays Chocolate 13-inch tall San Saba™ Men's cowboy boot that features a rustic chestnut leather upper accented by a tonal and cream stitching. The striking white trim around the scalloped collar and pull straps and star cut out are subtle details that set this boot apart. 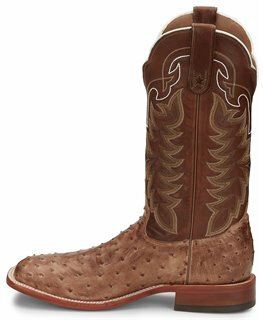 The distressed golden brown full quill ostrich vamp sport a square toe and unit heel for a relaxed fit in the stirrup. The Lama Comfort Technology® combines flexibility, stability and cushioning for major comfort and the double stitch welt provides durability. This style is proudly Handcrafted in the USA with imported materials.